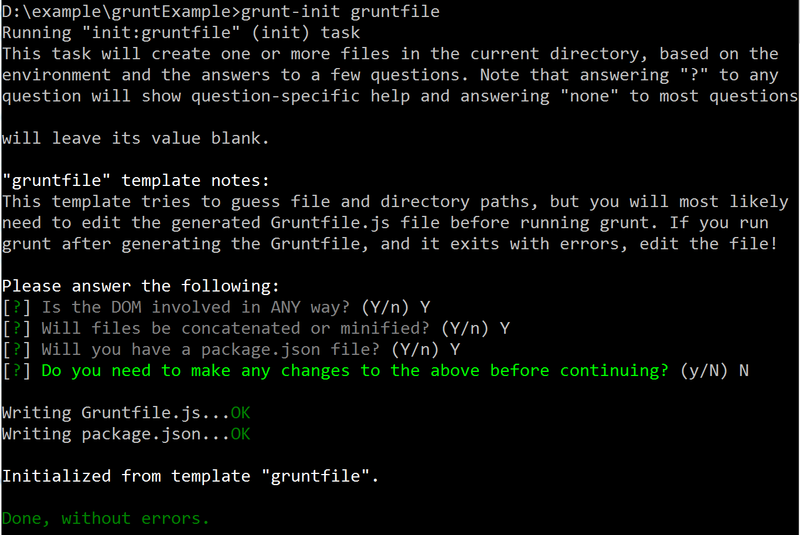 Grunt and Grunt plugins are installed and managed via npm (Node.js package manager). Before installing Grunt you need to make sure that Node.js is installed. 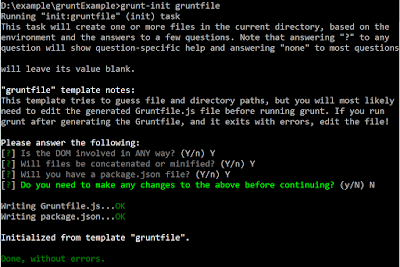 After you have installed all the grunt plugins, it is the time to add Grunt to our project. We will use Grunt's Project Scaffolding tools to generate a project. At first run : grunt-init --help you will see something like below. Now run the command grunt-init gruntfile, you will be asked few questions as shown below. After this two files will be created for you Gruntfile.js and package.json. You need to run npm install to install the project dependencies. After running npm install all the project dependencies will be included in node_modules folder. In the next part we will show you how to run Grunt in a project. Please Like and Share CodingDefined.com Blog, if you find it interesting and helpful.